How to export polygon coordinates to CSV (not WKT)? I am trying to export polygon coordinates from a shapefile to a CSV file, but so far all my attempts have failed. I have found numerous questions and answers about this, but none have solved my problem. which is a shapefile containing a basic world map. I have imported the shapefile into QGIS by adding a vector layer, and then I try to export the polygons with coordinates for each country. The tips that I have found suggest either saving the layer by right-clicking it and then selecting Save as or opening the attribute table and copying it into Excel. If I try these I only get master information with one row for each country in the map. Does anyone know how I can retrieve detail information for each country containing the polygons with coordinates? Use the plugin MMQGIS to export geometry to csv. I just try with your file, it works perfectly. Choose Layer > Save As... with format as CSV. Make sure 'Layer Option', 'GEOMETRY' is set to AS_WKT in the 'Save vector layer as...' window. The first column of the CSV file will now include polygon coordinates. A Greek way: A) Select the feature you want, copy it and paste onto a word processor. B) delete the first part wkt_geom… and the parenthesis at the end so there are only numbers. C) Replace: ,(comma and one space) with ^p (MS word) or \n (Libre office-Open office) D) replace one space with comma. You get the list of coordinates in the X,Y format. Not the answer you're looking for? 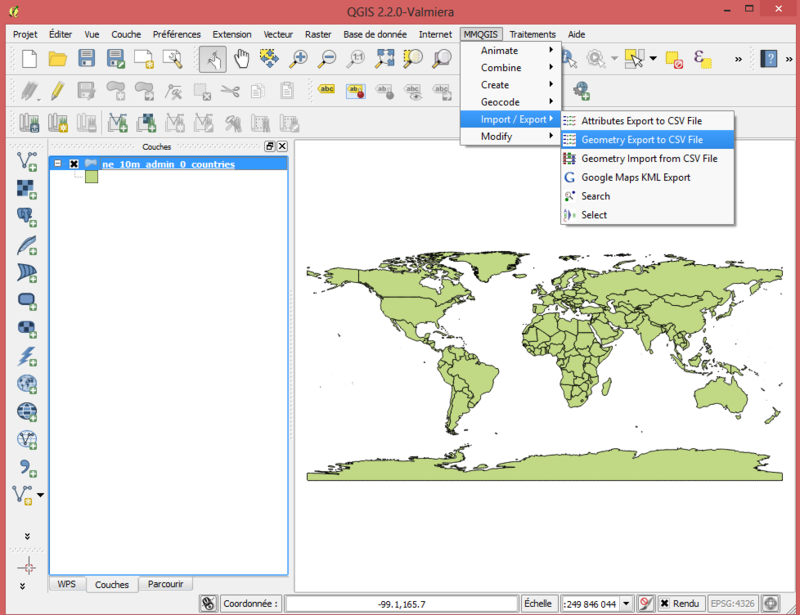 Browse other questions tagged qgis polygon coordinates export or ask your own question. Updating Polygon Geometries in master shapefile with detailed boundaries using ArcGIS Desktop? How to make a certain attribute Toggelable? How to export polygon coordinates?